Great product and at a great price. will always stay with this product been using it for 7 years. Our pets and we are very happy! Frontline does not work! First time ever, bought through your company. Works without side effects but expensive. This product does its job. This product has proven to be an effective way to control fleas and ticks on my dobermans. Product works very, very well. This product works very good. Seems to work very well. We've had no flea or tick problems. Frontline Plus is great for Dogs! Every time that I use your service I have nothing but praise. This product works very well on my dog. Never had fleas or ticks! Wonderful to get quality pet meds for fair price & not pay high vet price. Haven't seen a flea or tick on my 3 pointers in 3 years(since I began using Frontline). Worked great for Ticks, not so much for fleas. Have used it for several years and found it a good product. 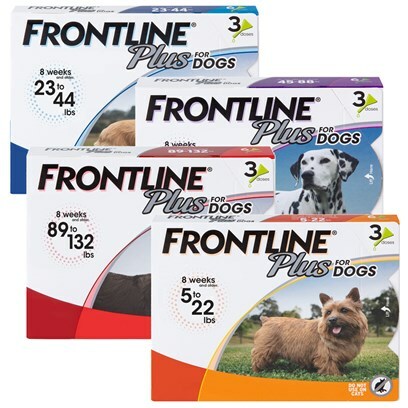 FrontLine Plus for Dogs - Great but at bit expensive! Using the product faithfully & although my dog acquired fleas, they were easily bathed off, no problems since. My dog still has fleas and my cats still have ticks. This product does not work well on my dogs! Year round protection, great price. Fleas must have become resistant.